You are Here : Home > Visit a Farm > New Mexico "Visit a Farm"
50-acre, non-profit urban farm located in the Los Poblanos Fields Open Space in the North Valley of Albuquerque, New Mexico. We grow healthy, organic food for Albuquerque schools, restaurants, and stores. In addition, we offer membership in a thriving community garden, support local food networks, and maintain wildlife habitat. Our education department provides fun-filled, educational farm visits and specialized workshops for children and adults. Davis Farms has shipped pumpkins commercially for over 20 years, and in 2009, prompted by growing community requests, opened Davis Farms Pumpkin Patch to the public! We feature a corn maze, hay bale maze, a sea of pumpkins, Pumpkin Mountain, hay rides and retail pumpkin and gourd sales. Visit Davis Farms Pumpkin Patch this season for tons of outdoor fun and learning! Private ranch managed as a "Center for Innovation & Retreats." Very reasonably priced and conveniently located, the charming setting, friendly staff, and variety of facilities at Synergia Ranch makes it the perfect location for your next seminar, workshop, gathering, business retreat or conference. 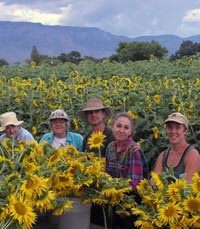 One of the most popular attractions at Eagle Ranch is our free farm tour. These tours offer our visitors an in-depth look at just how our delicious pistachios are grown and processed. The Historic Old Apple Barn was built in 1941 in Mountain Park, New Mexico. The Cloud-Climbing Railroad stopped at the barn to load apples grown on the spring-fed orchards of this beautiful area. Today you can take a walk back in time and experience a Vintage Emporium, Fudge Factory and Bistro. Enjoy the mountain view and mountain air on our seventy foot deck. As you plan your activities for the school year, we hope you will consider Costanza's family run Apple Orchard as your destination. Apples, so familiar to every child, are full of potential for discovery and study by curious students of all ages! Our emphasis is an integrated approach to the exploration of apples and life in the orchard.